Home brewers seem to have difficulty with the terminology on this one (as do the manufacturers of sterilising products in some cases!) - we all know what we have to do, but we can't seem to agree what to call it! To help, a list of commonly used terms with a strict definition of each is included at the bottom of this page. However, I think it's fair to say that when home brewers say 'Sterilise' what we actually mean is either 'Sanitize' or 'Disinfect'. Brewing equipment, like our cutlery and crockery, needs to be thoroughly washed and cleaned. Unlike them, it also needs to be thoroughly rinsed, following cleaning, to remove any traces of detergent. Traces of detergent in the finished beer will affect the surface tension and result in poor head retention (i.e. a flat, unattractive pint!). Sanitising and disinfecting are different from cleaning; and involve rinsing the equipment in a prepared solution which is designed to inhibit the growth of bacteria and yeast. Of the two, I would recommend chlorine-based disinfectants, as they are more effective against wild yeasts, and actually kill them, rather than just inhibiting growth (as sulphur dioxide does). NOTE: equipment must be thoroughly rinsed in clean tap water after sterilising with a chlorine based product - otherwise it will get into the brew, which can not only cause a health hazard, but also inhibit the activity of the brewing yeast. Many brewers use household bleach as a chlorine-based brewing disinfectant, but you need to make sure that it doesn't have perfume added (might taint the brew) and that you know the chlorine content and therefore how much to dilute it to get the correct concentration for disinfecting brewing gear. If you aren't confident about doing that, I would recommend buying a commercially available one, especially if it is combined with a cleaner (which saves a lot of work!). 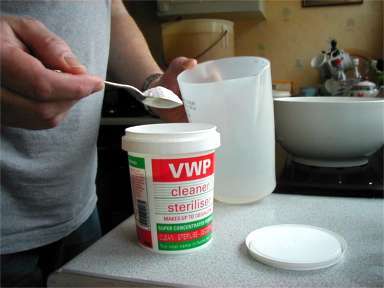 I usually use VWP Cleaner/Steriliser, which comes in the form of a white powder which you dissolve in water. If it touches the brew at any stage after boiling, sanitise it! Cleaning is the removal of dirt, oils protein and other material until the surface is free from the presence of foreign substances. It is not possible to sanitize until the surface is clean. Sanitizing is the reduction of micro-organisms, usually with heat or chemicals, to a point not considered harmful to humans. It does not guarantee a kill rate of 100%, but rather to a level around 99.9%. The products for sanitizing are often no-rinse at proper concentrations. Disinfection is a reduction of micro-organisms to a minimum kill level of 99.999%. The chemicals used in disinfection are often not safe for consumption, requiring a rinse after use. Sterilisation is the complete inactivation of all micro-organisms: fungi, bacteria, viruses and spores. Steam requires a minimum of 15 minutes at 121C or 3 minutes at 134C. Dry Heat requires at least 2 hours at 160C.